Fall is here and in full swing. While I hate the cold, I do love the cooler weather fashion. Furry boots, belted cardigans, riding boots, and sweaters are all on my list of Fall favorites. There's just something so comforting about an oversized sweater and boots. I enjoy starting off each new season with new clothes. I feel that every person should regularly treat themselves to wonderful clothes or accessories. Kohl's is your one stop shop for women, men, and children's clothing. Kohl's also features accessories, housewares, shoes and much more. It's truly a shopper's paradise. Need a new outfit for your upcoming Christmas party or maybe your son needs a new pair of jeans for school? No problem, Kohl's has you covered. They have the latest fashions at unbeatable prices. The clothes are made well and last. Christmas is rapidly approaching. Do you have all of your decorations ready to display in the next few weeks? Make sure to consider purchasing your Christmas tree and Santa decorations from Kohl's if you're still looking for decorations! Keep them in mind for your Christmas gift needs too. As you can see, Kohl's really does have it all. What I love most about Kohl's is that they always have something that I love each time I walk into the store. I sometimes lack self control and purchase things I don't truly need, but just like. I'm working on that issue. :) They have affordable prices with items always on sale, which is another plus of why I enjoy shopping there. Kohl's was kind enough to allow me to pick some Fall pieces for review. I've worked with Kohl's so many times now and I really enjoy partnering with them. It's always a fun experience. I browsed their website and fell in love with practically everything I saw. Since it wasn't possible for me to choose everything, I had to narrow it down to just a few items. That was a hard task and it took me a while to make my final decisions! I finally settled on five items that I truly loved. I tried to choose versatile pieces that were unlike anything I currently owned. Fashion is something I'm passionate about and I'm always up for trying new patterns, styles, and colors. I come in red, white, black, and blue! The Elle crochet overlay top was the first item I put into my cart. The second I saw it, I knew I had to own it. It had a vintage vibe that I absolutely loved. I contemplated choosing the black color, but I own so many black tops. Color is important for livening everything up in the Fall. The top fits me well and is comfortable on. It's form fitting, but not too clingy. I love the crochet flowers, it reminds me of the 70's. The flower detail is only on the front, which I actually prefer. I think it would be too much to have it on both the front and back. The flowers are securely adhered to the top. The red is more of an orangey red which is perfect for Fall, but it is slightly brighter in person. 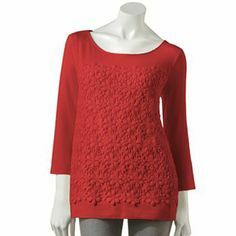 I can wear the top to work with dress pants, and also have it work well for an evening out with jeans and brown or black boots. I'm the queen of leopard. I love anything featuring leopard print and will actively seek it out. I think animal print is important for jazzing things up in moderation in a wardrobe. The Apt 9 essential cheetah tee was right up my alley. The material is very soft, comfortable, and seems well made. The colors are bright and vivid. I love that the leopard print is completely all over the shirt, instead of just in certain areas. I can picture going out with my husband or friends for a night out wearing this top with skinny jeans and black or brown riding boots. I might even wear this with black dress pants and gold jewelry to work. Leopard print adds an element of fun to any outfit. The flower print is so easy to fall in love with. I own many tops from Daisy Fuente's line at Kohl's. She always has adorable tops at fantastic prices. When I saw the Daisy Fuentes favorite scroll tee, I knew it would quickly become my favorite tee too! The cute black and white flower pattern is very pretty. The top fits me well and isn't too clingy, which I like. I think it looks good on me. The colors aren't bright and bold, but more muted. I wouldn't think to pair the top with a necklace like the model has on in the picture. I thought since the print was already busy the necklace would be too much, but I think it works well and I will consider wearing a necklace with it. Pair this outfit with skinny jeans and riding boots, or even bootleg jeans and clogs for a fashionable look. Black or gold jewelry would compliment the top well. This is my absolute favorite top of all for sure. The Daisy Fuentes floral knot-front top is so flattering on, and perfect for holiday parties. I know I made a great choice when I chose my second Daisy top! I really like the cute dark blue and black floral pattern. The colors pair excellently together and the print is very feminine. It fits me well and I'm happy with how it looks on. The knot detail on top helps bring an added element of style and completes the look. I would wear this outfit out to dinner or to a party with black or silver jewelry, skinny jeans and boots, You could even pair it with a black skirt for work. Finally, I settled on something a little bit different than the previous pieces I've mentioned. Since it's chilly outside, I wanted to choose something to help me stay extra warm. I debated on choosing pajamas, but I have so many pairs so I figured that wouldn't be a smart idea. I knew a belted cardigan would be a wise choice. What's cozier than a sweater in the Fall? That would be a belted cardigan of course! The rewind geometric cardigan is the perfect pick. I was drawn to this cardigan because the pattern reminded me of a Native American style. The cardigan fits me well and is extremely comfortable. It is slightly baggy under my arms, but I can't figure out if that's the style because it fits well everywhere else. The belt is easy to tie and the cardigan stays securely closed when tied. The black color is deep, rich and beautiful. The tan compliments the black nicely. I love the pattern that is featured all over the cardigan. You can wear a black or grey shirt underneath. Either color works fine. I can't wait to wear this with bootleg jeans and stiletto boots. I think it would be a really fun outfit. Don't forget gold or black earrings! As you can see, Kohl's has some wonderful pieces that any lady would appreciate having in her wardrobe. Head on over to Kohl's today for some retail therapy. *DISCLOSURE* A big thank you to Kohl's for supplying me with a gift card to cover these items. All thoughts are strictly mine. I tried to look for that cardigan in Kohl's last week and didn't find that print. I may have to search online. I love Kohl's!